Spring means melting snows, rising waters, variable weather, and more people hitting the woods..
On the afternoon of Friday, April 18th, dispatch received a cell phone call from a man who reported that his 48-year-old wife had stumbled on a large cobble while hiking about three miles down the Centerpoint Trail in the Ponca Wilderness, possibly fracturing her right ankle. He also said that she was unable to bear any weight on her ankle and that she was asking to be rescued. Rangers and resource management staff, joined by personnel from a variety of cooperating agencies, including the park’s search and rescue team, BUFFSAR, responded for the six-and-a-half mile round-trip carryout rescue. Rescuers carried a wheeled litter in to her location, stabilized her injury, packaged her into the litter, and carried her to the trailhead, where she was transferred to a waiting ambulance. A total of 39 people were involved in this rescue, all of whom demonstrated exemplary teamwork and communication. Ranger Melissa Moses served as incident commander. 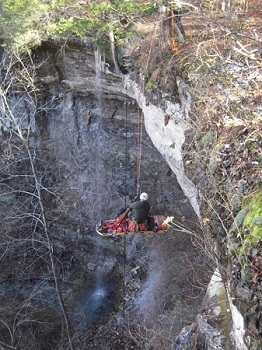 Less than 24 hours later, BUFFSAR personnel responded to a second rescue callout, this time for a 28-year-old man who had fallen about 50 feet while free climbing, or soloing, on a cliff in the vicinity of Hawksbill Crag in the Ozark National Forest portion of the Upper Buffalo Wilderness. He’d become painfully wedged in a tight crack between two large boulders on the ground, suffering significant injuries, and remained in that position for about two hours before first responders arrived at his location. Over 60 people were involved in the operation. They stabilized him, extricated him from the crack (which required some tricky patient handling), packaged him for a technical rescue, and conducted a vertical litter raising operation to the top of the 70-foot-high cliff. They then conducted a carryout for about a half mile to a waiting Air Evac helicopter, which airlifted him to Washington Regional Medical Center in Fayetteville, AR, where he is recovering from his injuries. Upper Buffalo District Ranger Mark Miller and Newton County SAR Coordinator Glenn Wheeler served as dual incident commanders under unified command. Good job Mr. & Mrs. Odie!! This entry was posted in Survival Weekly and tagged search and rescue, wilderness survival on April 27, 2014 by bigpigoutdoors.